Erdogan also stressed that the “aggressiveness” of Israel “threatens the future of the Israeli people”. That’s music for the Arab street. Palestinian President Mahmoud Abbas met Erdogan in Cairo – and confirmed he’ll go ahead with Palestine’s bid to be fully recognized as a state by the United Nations Security Council later this month. Palestine will definitely be accepted as a non-voting state by the UN General Assembly floor. The problem is the extremely non-representative Security Council – which sanctions full UN membership with state voting rights. It’s a done deal that Washington will veto it. The fractured European Union (EU), true to its character, still has not decided on a unified vote. There’s a strong possibility Britain and France will also veto the Palestinian bid at the Security Council. Yet even with the consolation price of “only” becoming a non-voting state, Palestine strikes a moral victory – aligned with world public opinion. Moreover, Palestine can become a member of the International Criminal Curt and sue the hell out of Israel over its serial violations of international law. Turkey’s game goes way beyond “neo-Ottomanism” – or nostalgia to revive the superpower days of the 16th and 17th centuries. It’s a natural development of Foreign Minister Ahmet Davutoglu’s policy of “zero problems with our neighbors” – moving to forge deeper bonds with most of these neighbors, and consolidating what Davutoglu himself defines as Turkey’s strategic destiny (see Turkey: the sultans of swing Asia Times Online, April 7, 2011). Turkey, for some years now, had decisively abandoned an isolationist brand of Turkish nationalism. The country seems to have finally surmounted the trauma associated to its dream of joining the EU; for all practical purposes the dream was shattered by France and Germany. As for the Israeli-Turkey alliance, in fact it kept the Arab world at bay and confined Turkey to a passive role of ineffective outsider in the Middle East. Not anymore. Erdogan can now afford to send multiple simultaneous messages to Israel, the US, the EU, assorted Arab leaders and most of all the Arab street. Davutoglu has been relatively magnanimous towards Israel, saying it is “out of touch with the region and unable to perceive the changes taking place, which makes it impossible for the country to have healthy relations with its neighbors”. What he could have added is with “friends” like that – Benjamin Netanyahu as prime minister, former Moldova bouncer Avigdor Lieberman as foreign minister, rabid settlers dictating policy – Israel does not need enemies; or rather fabricates enemies en masse. It is the Israeli government itself that accelerated Turkey’s rapprochement with Egypt – which is leaving Israel totally isolated. The touch of genius in the whole process is that Erdogan represents a democracy in a Muslim majority country strongly supporting both the Palestinians and the real pro-democrats in the Arab Spring. This provides a direct connection between the Palestinian tragedy and the spirit of the Arab Spring (which has nothing to do, it must be stressed, with the North Atlantic Treaty Organization (NATO) bombing Libya or a military junta running Egypt). It will be crucial to watch Erdogan’s Islam-rooted AKP’s follow-up. It’s virtually certain that in the next Egyptian elections the Muslim Brotherhood will come out swinging. It’s also virtually certain the Brotherhood will press for a minimalist relationship with Israel, including a full revision of the Camp David accords. In theory, Turkey would be fully behind it. There’s no evidence yet the TNC will be even able to hold the country together, not to mention promote “moderate Islam”. The (foreign) vultures continue circling. NATO’s secretary general, Anders Fogh Rasmussen, has been warning that Libya is in danger of falling into the hands of Islamic extremists who would “try to exploit” the current power vacuum. It’s unclear what role Turkey – a key NATO member – would have inside a NATO fully implanted in Libya. 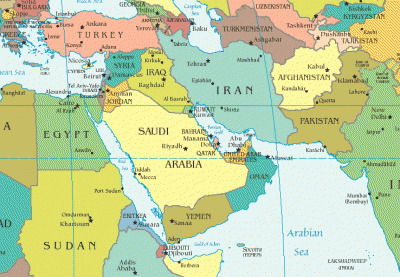 And all this while the Persian Gulf petro-monarchies – horrified by the Arab Spring – have proposed $2 billion in annual direct aid to Jordan so it will become part of the GCC, the Gulf Cooperation Council, also known as the Gulf Counter-revolutionary Club. As a monarchical club, the GCC wants Jordan and Morocco as new members. The icing on the cake, though, would be a monarchical Libya. On a parallel track, the counter-revolutionaries have been forced by Turkey to step up – at least verbally – their support for Palestine. Even Jordan’s King Abdullah, staunch US ally and Israel’s only “friend” left in the Middle East, has claimed that “the future Palestine are stronger than Israel is today”. Well, Israel did look for it – after the invasion of Lebanon in 2006, the massacre in Gaza in 2008 and the attack on the Turkish flotilla in 2010. In terms of world public opinion, Israel is toast – and even the Arab counter-revolution had to notice. That includes the House of Saud. None other than former Saudi intelligence supremo Prince Turki al-Faisal wrote a New York Times op-ed piece stating outright, “Saudi leaders would be forced by domestic and regional pressures to adopt a far more independent and assertive foreign policy” if the US vetoes the Palestinian bid at the Security Council. Prince Turki also stressed that everything must evolve around a two-state solution based on the pre-1967 borders, which every grain of sand in the Sinai knows Israel will never accept. In the event of a US veto, Prince Turki threatened Saudi Arabia would be “opposing the government of Prime Minister Nuri al-Maliki in Iraq” and would “part ways with Washington in Afghanistan and Yemen as well”. Now imagine the House of Saud lavishly funding a double guerrilla war all across the Pentagon’s “arc of instability” – Sunnis against Shi’ites in Iraq plus the already turbocharged Taliban in Afghanistan – while lobbying for an Islamist government in both Egypt and Turkey; and this while Egypt and Turkey for their part fully collide with an isolated and angry Israel. Now that’s what the “birth pangs of the new Middle East” are all about. 1. Robust private sector gives Turkey fastest H1 growth worldwide Zaman, September 12.